Highlight: In 2006, following the seizure of Mogadishu by the Union of Islamic Courts (UIC),. Updated again with its effect in Mekele, al-H̨udaydah, Assab towns. ****** Areas in the Eritrean Ethiopian border. The US media CBS-News has been running a series titled ‘The world’s enduring dictators’ since. The whistleblowers’ site Wikileaks published a leaked Cable of US Embassy Addis Ababa. This is. Presumably, you are aware of the aberrant behavior of the Eritrean strongman. At least, you. A recently leaked Cable of the US Embassy in Berlin, published by the whistleblowers’ website. 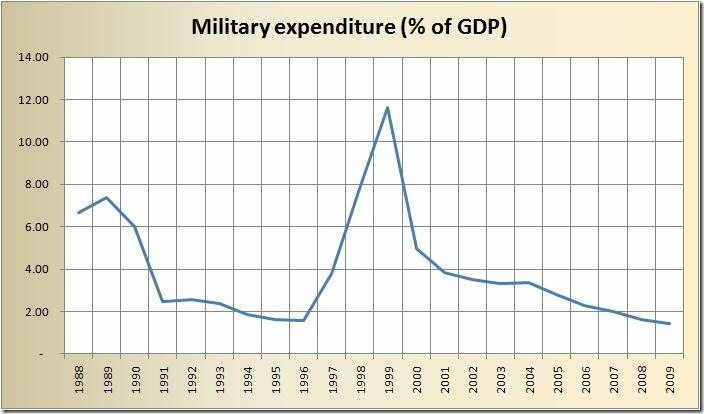 The share of Military related expenditure has decreased to 1.42% of GDP in 2009, though the nominal size(not adjusted for inflation) increased to 4.7 Billion Ethiopian Billion Ethiopian Birr. Similarly, according to the recent available data, the active military personnel count 0.36% of the total labor force. The size of the Army has also decreased to pre Ethio-Eritrean war times.